A whiff of mulled wine and incense in the air is enough to take any visitor back to their memories of a real German Christmas market. One of the great pleasures is standing out in the cold (naturally wrapped up well) and enjoying a punch or a hot wine while looking at all of the passers-by. 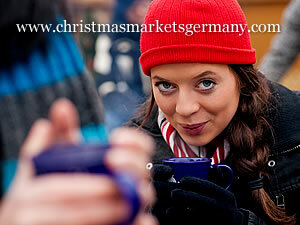 Mulled wine is the main drink at the markets. It's so popular that many of the markets have special decorated cups for the wine. You pay a deposit for them and get it back when you return them or just keep the cup as a souvenir of your visit. Glühwein, as mulled wine is known in Germany, is essentially red wine heated with spices, lemon and sugar - generally cinnamon and cloves are used in all recipes, with some adding aniseed or vanilla. A variation on the mulled wine is the Feuerzangenbowle. This is Glühwein but with the addition of sugar caramelised by burning rum. Apart from the usual staples of any German market (sausages), Christmas markets have some special delicacies that are particularly relevant to this time of year. Lebkuchen are biscuits which are similar to gingerbread. They can be soft or hard and these days are frequently seen in the shape of a heart with a message in icing on them. They are particularly closely associated with the Nuremberg Christkindlesmarkt and there are rules designating who can produce original Nuremberg Lebkuchen. 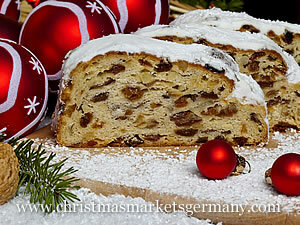 Another Christmas favourite is the Stollen cake, or Christstollen. This is soft fruit loaf style of cake and is closely associated with the Dresden area. The Dresden version is called a Striezel and the main Christmas market in that city is named after it. It is supposed to represent the shape of the mouth of a tunnel - many of the visitors to the markets in Dresden in centuries gone by would have been miners who worked in the pits and shafts of the Erzgebirge.